302 pages | 86 B/W Illus. 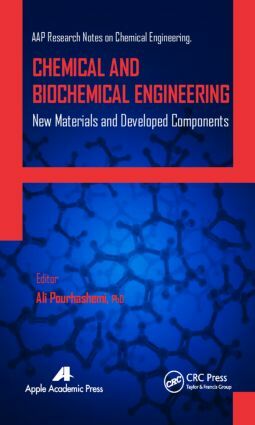 Ali Pourhashemi, PhD, is currently a professor of chemical and biochemical engineering at Christian Brothers University (CBU) in Memphis, Tennessee. He was formerly the department chair at CBU and also taught at Howard University in Washington, DC. He taught various courses in chemical engineering, and his main area has been teaching the capstone process design as well as supervising industrial internship projects. He is a member of several professional organizations, including the American Institute of Chemical Engineers. He is on the international editorial review board of the International Journal of Chemoinformatics and Chemical Engineering and is an editorial member of the International of Journal of Advanced Packaging Technology. He has published many articles and presented at many professional conferences. A. K. Haghi, PhD, holds a BSc in urban and environmental engineering from University of North Carolina (USA); a MSc in mechanical engineering from North Carolina A&T State University (USA); a DEA in applied mechanics, acoustics, and materials from Université de Technologie de Compiègne (France); and a PhD in engineering sciences from Université de Franche-Comté (France). He is the author and editor of 65 books as well as 1000 published papers in various journals and conference proceedings. Dr. Haghi has received several grants, consulted for a number of major corporations, and is a frequent speaker to national and international audiences. Since 1983, he served as a professor at several universities. He is currently editor-in-chief of the International Journal of Chemoinformatics and Chemical Engineering and Polymers Research Journal and on the editorial boards of many international journals. He is a member of the Canadian Research and Development Center of Sciences and Cultures (CRDCSC), Montreal, Quebec, Canada.